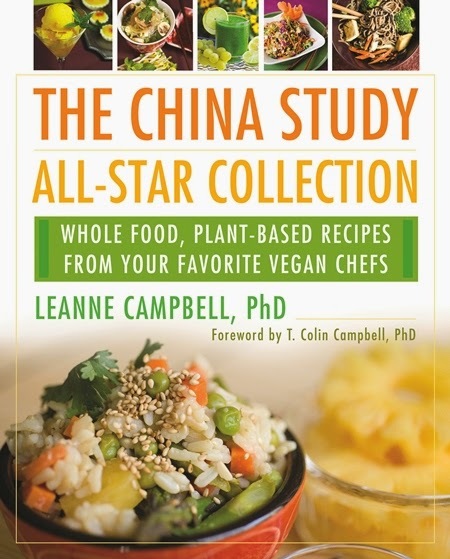 Following her bestselling The China Study Cookbook, Leanne Campbell brings together top names in the Plant-based community to share their favorite and most delicious recipes in this awesome THE CHINA STUDY All-Star Collection. LeAnne Campbell, PhD, lives in Durham, North Carolina and has been preparing meals based on a whole foods, plant-based diet for almost twenty years and for her two sons - Steven and Nelson, who are now twenty and nineteen. As a working mother, she found ways to prepare quick and easy meals without using animal products or adding fat. More and more doctors are recommending a plant-based diet as the foundation of your healthy eating plan. When you have a strong foundation, your body can resist disease and illness. A good diet is the most powerful weapon we have in the fight for real health. Pioneering chefs (like myself), and those contributing to this book continue to demonstrate the ease and pleasure of using a plant-based diet. Their are so many possibilities and a lot of recipes are just simple with a few ingredients. The cookbook author contributors include: Chef AJ, Ani Phyo, Christina Ross, Christy Morgan, Del Sroufe, Dreena Burton, Heather Crosby, John and Mary McDougall, Laura Theodore, Lindsay S. Nixon and Tracy Russell. You should definitely add this beautiful book to your collection. You won't be disappointed!! 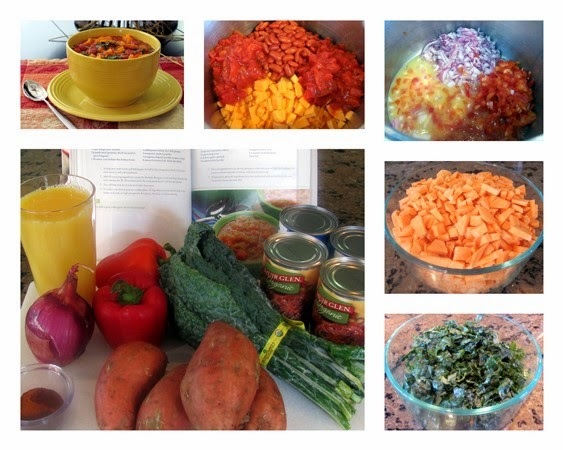 The recipe I choose to share with you is Chef AJ's Sweet Potato Chili with Kale. Since cold weather is right around the corner, I am starting to think about what kind of healthy, warm soups I will make and this chili caught my attention. I love this recipe for many reasons. First, it is bursting with so much flavor having not one grain of salt or any fat added. AMAZING!!! Second, I love that it is bursting with nutrition, and far beyond. Third, it is a gorgeous, hearty and satisfying soup. I hope you will give this recipe a try and let me know how you liked it. There is no dish that can’t be improved by the addition of kale! 1. In large pot, sauté onion and bell pepper in half of the orange juice for 8–10 minutes until onion is soft and translucent. 2. Add all remaining ingredients except for the kale. Bring to a boil and then decrease heat to let simmer for 25–30 minutes until the sweet potatoes are soft but not mushy. 3. Turn off heat and stir in kale so it wilts, then serve. 4. To make in an electric pressure cooker, place all ingredients except for the kale in the cooker and cook on high pressure for 8 minutes. Stir kale in before serving. This dish is great with a piece of corn bread on top! Your article really makes sense. I’m satisfied by the way you brought out ideas. Good luck for sharing. Keep on posting! usa health product Various conditions and needs may lead to take supplementary medicines or daily use products.usa health products It is easy to get them with complete information available online. Great blog nice n useful information about lettuce and its benefits, it is very helpful for me, After reading your blog, I am planning to start taking organic foods on my day to day life. I really appreciate thanks for sharing.